We’ll be updating this page as often as we can to answer some of the most frequently asked questions we get regarding our teleprompters. If you don’t see your issue here, please feel free to contact us, and we’ll be happy to help you any way we can. Q: How do you control the script speed to keep on pace with the reader? 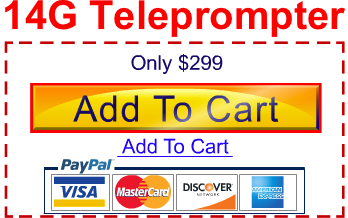 If you have an iPhone, iPad or iPod Touch and you want to buy ProPrompter, click here. It costs about $10, and you only have to pay for the app once if you use the same Apple ID to download it onto multiple devices.